This is one of the hardest ensemble from 1968 to find. 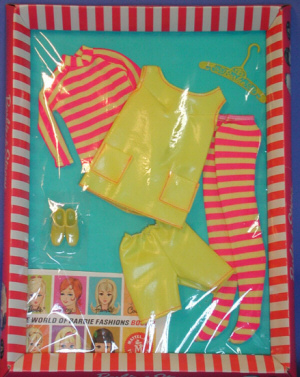 The long sleeve turtleneck and tights are bright yellow and hot pink stripes. They are topped by a bright yellow shiny vinyl tunic and shorts. The tunic has a scoop neck and patch pockets. Both of the vinyl pieces are stitched in hot pink. I think one of the reasons it is hard to find is that the vinyl does not hold us as well through the years as the fabric pieces.